I just bought a 200sx that needs the top end put back together after the previous guy ran out of time on his project. I need the head studs for sure, but he also mentioned needing the exhaust and intake ones as well. Where can I find all of these? Local auto shops don't seem to be carrying them, and anywhere online has really hard to read blow-up diagrams to find the part numbers. I went to ARP for studs instead of bolts. Problem was that I had to have the original head bolts to get the proper length and diameter. They did have a kit for the CA18DET head which is close, maybe you could see if they have that and then work on the bolts that are different? Other source for many parts is Rock Auto, they carry an amazing amount of parts for our old cars. Hope this helps! I have gotten some parts from them, so it is worth a try. When I needed a new battery cable for the SE they could not produce it. BUT, there was another place out in CA that took the on-line order. They asked for the VIN, and were able use that to leverage the part from Japan, and they offered a discount on top of that! Shows that you can connect sometimes if you don't give up! NissanPartsZone is most helpful in that they have all the parts breakdowns available on-line. I have scored good parts from OEM-Surplus using the diagrams to make sure I am getting the right stuff. The old gray matter is stirring...when I dealt with ARP they did not have a CA18ET specific stud kit, I had to fill out a sheet with measurements and they made up a kit for me. Only had an issue with one stud that was not the correct length, and we got that straightened out. If you intend to upgrade this build at all (bigger turbo, intercooler, etc) I would suggest getting a metal head gasket from Cometic and use studs instead of bolts. I blew the standard head gasket twice with just the original turbo. I upgraded years ago and was in the middle of it when I discovered this forum. I found tons of great ideas, and many who said "ditch the ET". I know I have well over 300k miles on my car and engine, it's a daily driver. The engine has held up well FOR ME, but many have destroyed theirs expecting too much. I am happy with the results of a T-25 turbo, intercooler, and larger (2.5 inch) exhaust. I don't drift, my car is as I bought it back in 1987. It's economical and fun to drive, plus utility is a major plus as I can haul my drums, tools, aircraft parts and whatever in the back. If you need pictures or more info, I will gladly share to get you going. Went with NissanPartsZone the night I posted this, and they haven't told me that they're out of stock or anything yet. Waiting for that or a shipping confirmation. I'm done with the head, so I'm just waiting on these to put my top end in and getting started on messing around with hoses. Excellent! I hope to hear of success soon. What would y'all recommend for a good, reliable, and relatively easy to read diagram for vacuum lines and coolant/oil/fuel lines and the like? 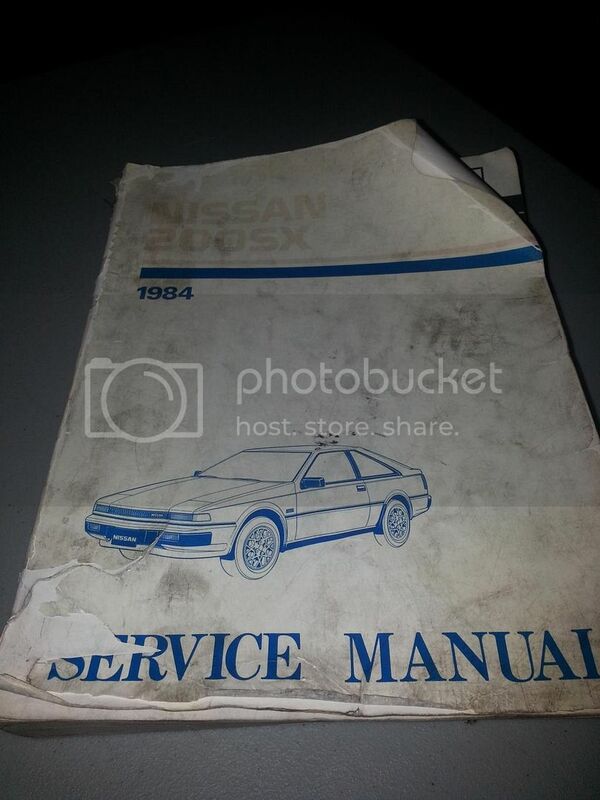 Search on the forum for a copy of the Factory Service Manual (FSM) or you might score a copy on e-gay. I got one for $25 last year. NissanPartsZone finally sent me my shipping confirmation today, so I'm only a few days away from dropping in my head. Which leads me to my next question, since the head is new, do I need to break it in? And if so, how? Here's an EBay special for you! Haha if you don't have one yet then you are already needing one. It is a mandatory tool for your S12 and a requirement of all club members!! Seriously, it will save you hours of work and next to this club it's your most important S12 resource! Mine has been invaluable so far. Now that I'm putting in my KA, most of it is going out the window. So, if you want head studs for the ca18et you can call up arp and order the set for the a14 nissan as it also fits our engine. the only thing is the 1 long studs needs to not be installed to full depth so that the stud is above the top of the nut when torqued. ^^^ Yeah, I recall something like that. You can get the proper length stud is you can get accurate measurements to ARP, I did. You don't want to partially thread in a stud if you can help it. Anyone know anything about breaking on a new head? Is there a break in period at all? And if there is, what is it? I don't wanna screw up my new OEM Nissan head. It's so shiny, it'd be a shame. so if it is truly all brand new the cam will need to be broken in at 1500-2000 rpm for 15 minutes with normal oil ie not synthetic. you should also change the oil if it also an engine rebuild within the first 500 miles or so. oh and when i talked with arp they said that they actually dont recommend putting the studs and sinking them down they recommended putting it in hand tight ish and then back it out about half a turn to a turn. Do I need to retighten the head bolts after breaking in the cam? ARP site says no retorque required. Head bolts stretch, the studs don't. If you hear some clatter after running the engine for awhile, then you will need to reset the clearances.